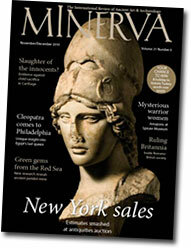 Pala International is pleased to reprint (as of December 17, 2012) the following article that appeared in Minerva magazine, November/December 2010. Note that due to layout considerations we have renumbered Figs 8, 9 and 10 below, from their original sequence. The gemstone known to ancient Greeks and Romans as topazos is the modern peridot, the gem variety of the mineral olivine ([Mg, Fe]2SiO4). This mineral varies from transparent to translucent and, as its name implies, typically has an olive-green colour. It is the large, transparent crystals of good yellowish-green colour that are called peridot. This was used sparingly in the Mediterranean region during the Hellenistic and Imperial Roman periods, with known artefacts ranging in age from 250 BC to AD 500. Most of these are plain or intaglio-cut stones for finger rings (Figs 2, 3, 5). It is commonly claimed that peridot was also used earlier in Pharaonic Egypt, but there is no credible archaeological evidence to support this. 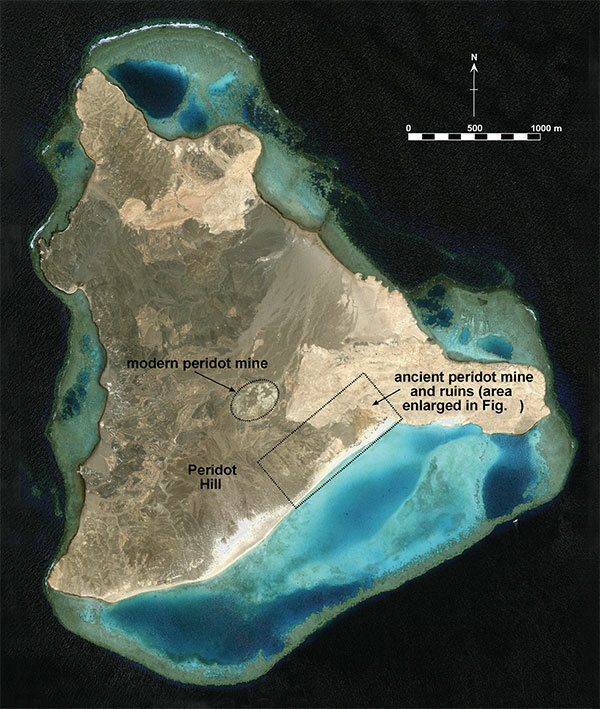 The only known ancient source of peridot is Zabargad (or Saint John’s) Island, off Egypt’s southern Red Sea coast (Fig 4). The Greek historian and geographer Agatharchides of Cnidos (writing in the mid 2nd century BC but using 3rd-century BC sources) called the island Ophiodes (Snaky) in his On the Erythraean Sea (5.84) and said topazos was best found just after sunset, giving rise to the appellation ‘evening emeralds’, which is sometimes applied to peridot today, although it is a misnomer. Agartharchides’ account was largely paraphrased by Diodorus Siculus (1st century BC; Library of History, 3.39.3–9) and Strabo (63/64 BC – AD 21/24; Geography, 16.4.6). A final Hellenistic reference to Red Sea peridot is topazion Aithiopias in Job 28:19 of the Greek Septuagint Bible, where this gemstone is said to be of less value than wisdom. Fig 1. Ancient mining pits at N 23° 36.20’, E 36° 12.00’. Photo: J.A. Harrell. The Roman writer Pliny the Elder (AD 23/24–79) in his Natural History (6.33.168–170, 37.32.107–108) called the island Topazos after the gemstone but said it was formerly known as Cytis. Still another name was applied to the island by the Alexandrian geographer Claudius Ptolemy (AD 90–168) who called it Agathonis (Geography, 4.5). The Periplus of the Erythraean Sea, written around the mid 1st century AD by an unknown Greek-speaking Egyptian involved in the Eastern trade, does not mention the island but identifies chrysolithon (goldenstone) as the only gemstone exported from Egypt to India. Chrysolithon could well be an alternative name for peridot, given its ‘wonderful golden appearance’ as Agatharchides describes it (On the Erythraean Sea, 5.84) and Pliny’s recognition of the chrysopteros (golden-feathered) variety of topazos (Natural History, 37.32.109). Elsewhere, Pliny refers to ‘chrysolithos… from Aethiopia’ (37.42.126), probably meaning Egypt’s southern Eastern Desert at the northern edge of Roman Aethiopia, but he apparently mistakenly thought this was something other than topazos. The only other gemstones mined in Egypt during the 1st century AD were amethyst (purple quartz), emerald (green beryl) and possibly turquoise, all the wrong colour for chrysolithos—although citrine (yellow quartz), made from heat-treated amethyst, is a remote possibility. Subsequent Roman and later medieval writers merely repeated, often in a much garbled form, what Pliny and others reported earlier about topazos and chrysolithos. The modern term ‘chrysolite’ was derived from chrysolithos and has been applied to a number of yellowish gemstones, including peridot. The modern Arabic name for peridot is zabargad, although there are many variant spellings. Zabargad is referred to by several medieval Arab writers, who sometimes mean peridot but more often apply it to emerald, Egypt’s other green gemstone. Of these, the Turkish traveller Ibn Hawqal is the only one to specifically mention peridot’s Red Sea source. In his Face of the Earth, written in AD 977, Ibn Hawqal seems to infer that zabargad came from an unnamed island near the port of Aydhab (close to modern Halaib; Fig 4). Later, the Egyptian scholar Al-Tifaschi, in his Best Thoughts on the Best Stones written about AD 1240, said that in his day all zabargad came from the ruins of ancient Alexandria in Egypt. When the Portuguese explorer Juan de Castro passed by Zabargad Island in 1541, he identified it in his logbook as Zomorgete, a corruption of Zabargad and a name he must have learned from an Arab guide. Thus Arab mariners, if not scholars, were aware of Zabargad Island and its peridot at least as early as the 16th century. Fig 2. 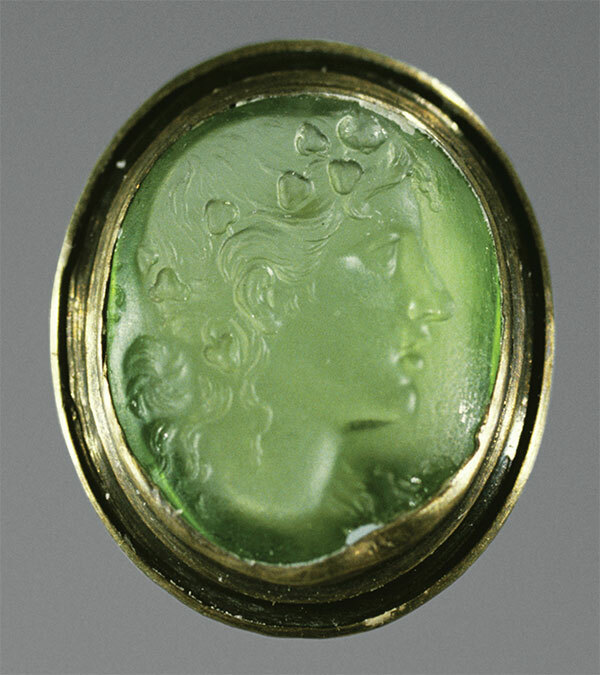 Peridot intaglio of a maenad wearing a wreath of vine leaves in her hair and a bunch of grapes over her forehead. Carved for a 2nd-century BC finger ring but now in a modern setting. Stone c. 18 x 16 x 5mm. Ashmolean Museum acc. no. 1892.1497. Courtesy of the Ashmolean Museum, University of Oxford. Photo: Lisbet Thoresen. The next recorded visits to Zabargad by Europeans were from James Bruce of Kinnaird in 1769 and James Raymond Wellsted in 1834. Both thought they had found emeralds on the island, which Bruce (in his 1790 Travels to Discover the Source of the Nile) referred to as Siberget, while Wellsted, in his 1838 Travels in Arabia, called [it] Saint John’s. Wellsted was the first person to actually mention the ancient mine workings when he reported ‘numerous and extensive excavations… made at a very early period’. After his visit, the island was forgotten until its final rediscovery about 1900. Peridot mining was initiated soon after by the Peridot and Egyptian Gems Company and continued sporadically until the 1950s, when the mine was closed by the Egyptian government. Since then there has been occasional surreptitious activity, and even now cabochons of Zabargad peridot can be found in some gem shops in Cairo’s Khan Khalili bazaar. Fig 3. 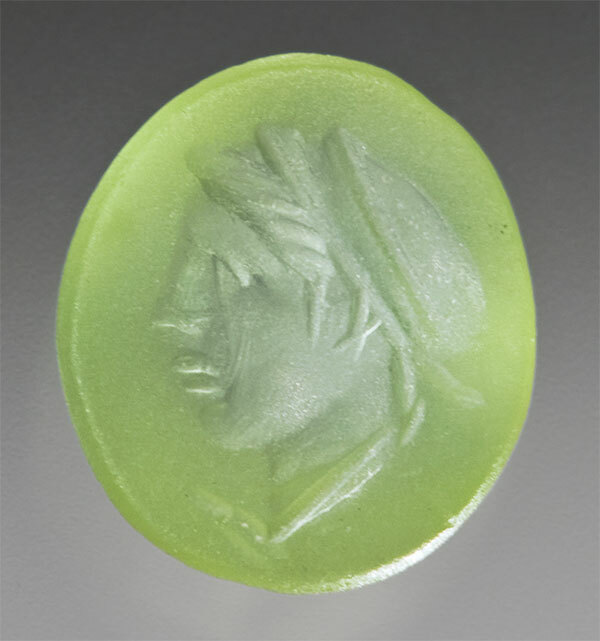 Peridot intaglio of a male head, possibly Ptolemy XII of Egypt, wearing a broad diadem and aegis at the neck. Carved for a mid 1st century BC finger ring. 8.5 x 7.4 x 3.1mm. Michael J. Shubin Collection, ms-010. Photo: Lisbet Thoresen. 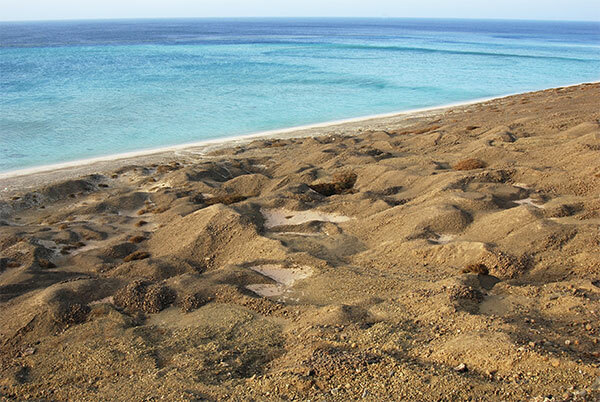 Although Zabargad Island’s geology and modern mine have been discussed in numerous published papers, with the exception of Wellsted’s passing remark about early excavations, the Hellenistic-Roman peridot mine has not been identified or described until now. The senior author visited the island and found the ancient mine on its south-east shore, along with some associated ruins and a water well (Figs 6, 7). The mine workings occupy the lower slope of the 235m-high peak known as Peridot Hill. They consist of about 150 open pits, which are up to 20m across with tailings piles rising as much as 5m above the pit floors (Fig 1). These were excavated in peridotite, the bedrock underlying Peridot Hill, but only where it had been altered by hydrothermal fluids in a process known as serpentinisation. The serpentinised peridotite is a moderately soft rock, and so the peridot crystals, which tend to be concentrated within fracture zones, would have been relatively easy to extract. Most of the modern mine workings, which are also in serpentinised peridotite and include deep adits as well as open pits, are on the north-east side of Peridot Hill (Fig 6) with the rest on the south-east side but above the ancient mine, which has thus been left undisturbed (Fig 7). The latter workings also produced some garnierite, a valuable nickel-bearing mineral. Fig 4. 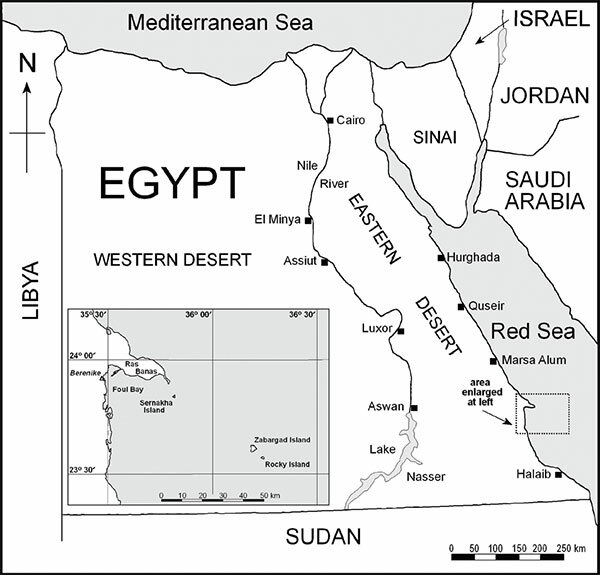 Map of Egypt showing the locations of Zabargad Island and Berenike. Drawing: J.A. Harrell. Peridot crystal fragments up to 1.5cm across are commonly found on the ancient mine tailings (Fig 10). The modern mine has reportedly yielded whole crystals up to 20cm in length and crystal fragments nearly as large as this, although of poorer quality, were observed by the senior author. Similarly large peridots undoubtedly came from the ancient mine as well. Indeed, as Pliny says, although with some misunderstanding, ‘topazos is the largest of gemstones’ (Natural History, 37.32.109). This claim is certainly consistent with the large size of some of the Hellenistic and Roman ring stones, such as that shown in Fig 5. Fig 5. 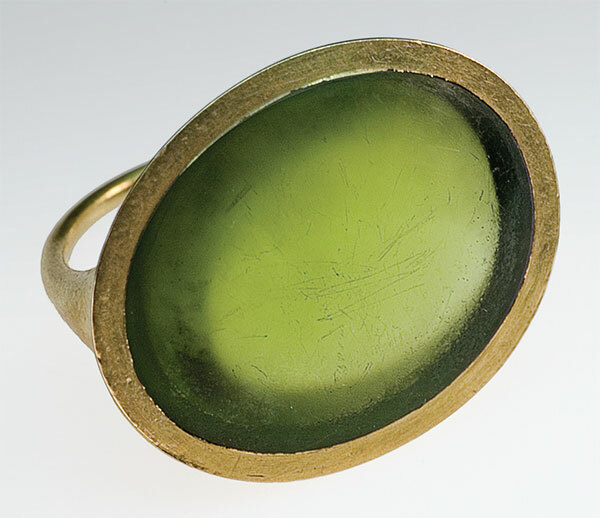 Early 1st century AD Roman finger ring of peridot and gold. Stone c. 25.9 x 21.4 x 8.8mm. Antikensammlung misc. inv. 7074. Courtesy of Antikensammlung, Staatliche Museen zu Berlin. A. Greifenhagen, Schmuckarbeiten in Edelmetall, vol. 1, Berlin 1970, 81 pl. 60.9. Photo: Lisbet Thoresen. Two sites with ancient ruins were found on limestone terraces near the mine. The easternmost of these is located within an embayment between two low hills, which provided it with some protection from the wind. It is dominated by the remains of a large (10 x 17m), triangular building with massive walls (1–2m thick), which are now largely collapsed but still standing in places up to 2m high (Fig 8). This structure is partitioned into two rooms but, oddly, lacks an obvious entrance. Its north wall (at right in Fig 8) cuts into the backing hill slope. Adjoining this building is a smaller and more lightly constructed one (7 x 7m with walls less than 1m high and wide), which is divided into two rectangular rooms. The low walls of this structure probably served as footings for either animal-hair tents or huts with a timber frame supporting sides and top of brush or matting. The higherwalled building beside it would have been roofed over with similar materials. The western site has a low, rectangular enclosure (5 x 9.5m with walls less than 1m high and wide) set in an area cleared of all surface rubble and separated from the backing hill slope by a line of stones (Fig 9). The walls at both sites were made with unshaped, dry-laid (unmortared) pieces of locally available stones, mainly limestone cobbles and boulders. The paucity of material remains at these sites, as well as their possible reuse or modification by later visitors to the island, make interpretation of the ruins difficult. It seems likely, however, that the eastern site served as the principal camp for the peridot miners. Fig 6. Quick Bird satellite photo of Zabargad Island showing the locations of modern and ancient peridot mining. Photo: Digital Globe Inc. Longmont, Colorado, USA. Fig 7. Close-up of the area outlined in Fig 6 with the ancient mine, ruins and well. Fig 8. Massive building in the eastern ruins (foreground, above), at N 23° 36.42’, E 36° 12.28’. Photo: J.A. Harrell. Fig 9. Western ruins (foreground, below), at N 23° 36.41’, E 36° 12.12’. Photo: J.A. Harrell. 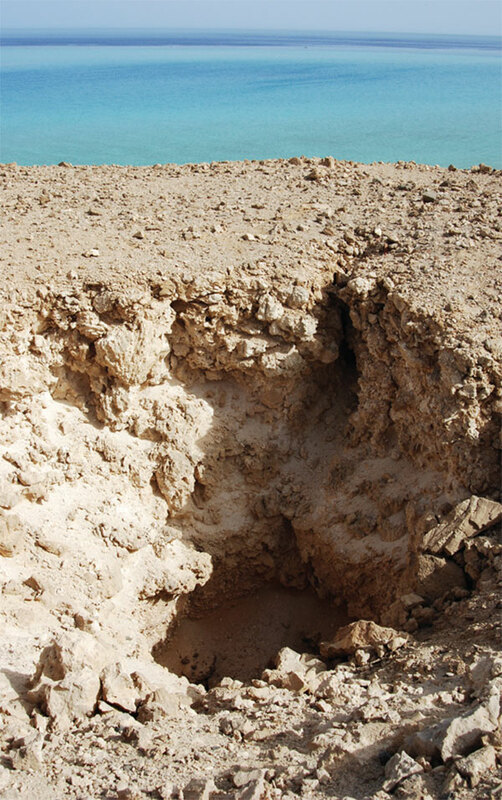 Between the western ruins and mine, and also on a limestone terrace, is a water well (Fig 11). Wellsted mentions seeing this in his visit 175 years ago, reporting that it was used by turtle hunters, whose three stone huts and mounds of turtle bone and shell can still be seen today near the eastern ruins (Fig 7). Only the upper 5m of the well remains open, and the lower portion (about 2m in diameter) is blocked by rubble collapsed from above. Beside the well is a shallow depression where it seems another well was started and then abandoned. Fig 10. 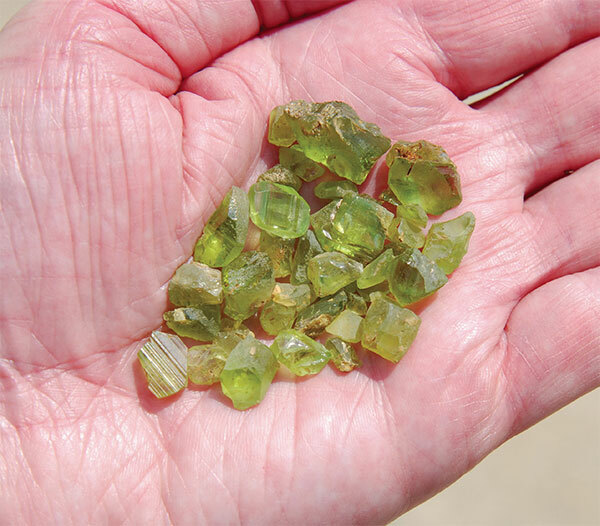 Peridot crystal fragments found on the ancient mine tailings. Photo: J.A. Harrell. Ceramics are rare in the mine workings and both ruins, but abundant around the well. Although later periods may be represented in the pottery corpus, the several amphorae observed date mainly from the mid 3rd to 1st centuries BC, with the rest extending into the Roman period, according to ceramics expert Roberta Tomber. Zabargad is the quintessential desert island, with no surface water, bushes but no trees, and no animals apart from those frequenting the shore—seabirds, sea turtles and crabs. The miners could have obtained food not only from these sources, but also from the sea life that abounds on the island’s fringing reef and in its lagoons. Turtle shell was a valuable trade commodity during the Roman period and this may also have been a by-product of the mining operation. Some supplies, such as plant-derived foods, must have been brought from the mainland. The size of the workforce is unknown, but judging from the limited space available in the eastern camp and the difficult supply situation, there were probably not more than 10–20 men working on the island at any one time. The large number of mining pits and their great sizes are more a testament to the longevity of activity on the island than its intensity. Mining was probably restricted to the late autumn and winter months, which provided comfortable working temperatures and occasional rainfall, essential for replenishing the groundwater tapped by the well. Fig 11. Ancient water well, at N 23° 36.32’, E 36° 12.11’. Photo: J.A. Harrell. 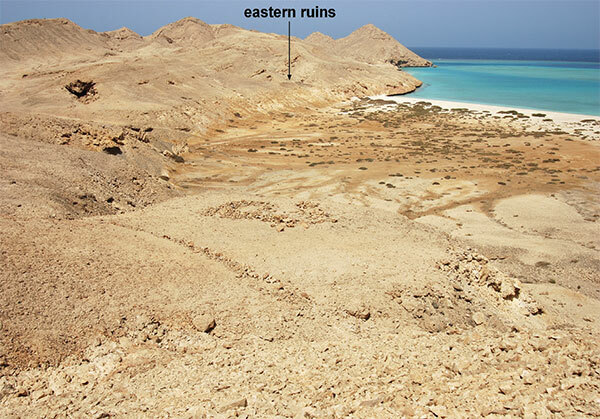 The peridot miners and their supplies almost certainly came from the Ptolemaic-Roman port city of Berenike, 80km north-west of Zabargad Island (Fig 4). Berenike is the closest potential source, but there are also archaeological connections between the two sites. For example, numerous peridot crystal fragments have been recovered from the early and late Roman levels in excavations at Berenike, and the pottery on Zabargad is typologically similar to that at Berenike. Additionally, there is Pliny the Elder’s claim (Natural History, 6.33.168, 37.32.108) that the mine and port were started during the reign of Ptolemy II Philadelphus (285–246 BC) and this is in accord with the archaeological record. Berenike experienced three peak periods of activity: the mid 3rd to mid 2nd centuries BC of the Ptolemaic period, the 1st century AD of the early Roman period (the zenith of the port’s commercial prosperity), and the mid 4th to 5th centuries AD of the late Roman period. It is likely that mining activity on Zabargad closely mirrored the rise and fall of Berenike’s fortunes. The port city was abandoned by the mid 6th century AD, and with it the peridot mine on Zabargad Island. James A. Harrell is Professor Emeritus of Archaeological Geology at the University of Toledo, USA. For the past 23 years, he has been conducting a field survey of ancient Egyptian quarries and mines. Elizabeth G. Bloxam is a research associate in the Institute of Archaeology at the London University College (United Kingdom). 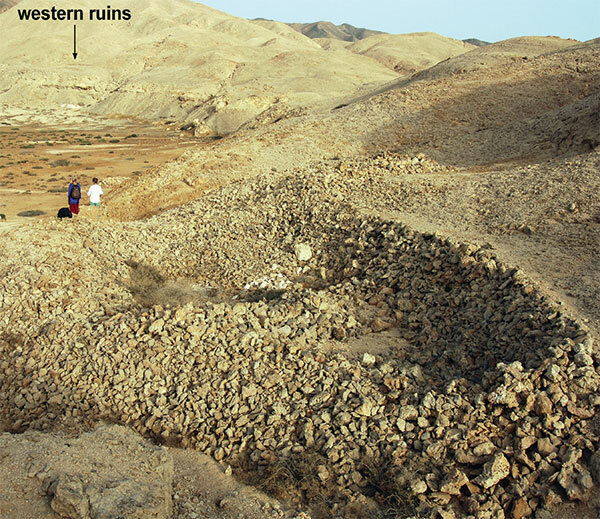 Her research concerns the social organisation and logistics of ancient quarrying and mining in Egypt.